This talk on decoding wireless tire pressure monitors got me thinking: what other wireless electronics could I snoop on? I've done this in the past with our neighborhood utility boxes, but that was little more than running a program someone else wrote. The tire pressure decoding work is remarkable in that an individual managed to turn wireless noise into useful data. 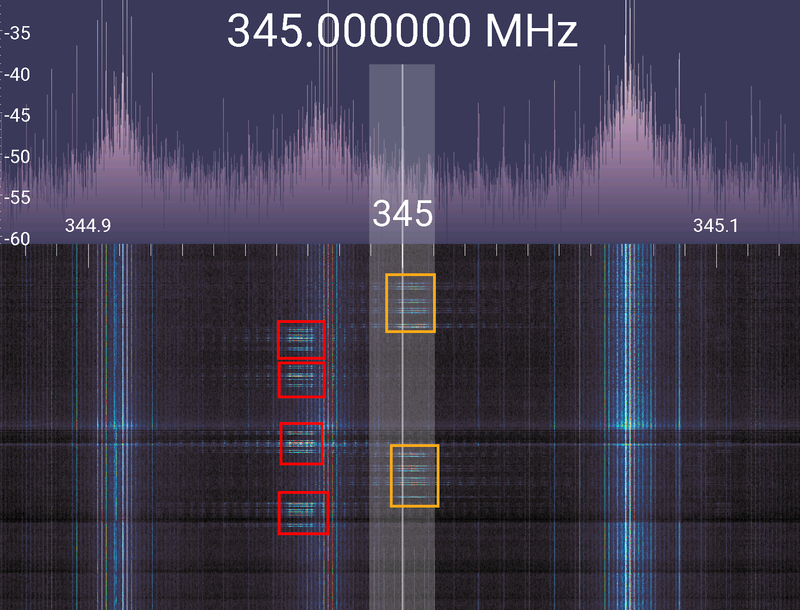 Even if you're not a radio hacker, the talk is worth your time, just to see how seemingly dark systems can be illuminated given the right know-how. I racked my brain for a good wireless device to poke around and then it hit me: what about my alarm system? I don't know much in the way of technical details of our system, but I do know it's wireless. Which should mean that each alarm component is sending bursts of radio traffic to one central receiver. I doubted that I could decode the bursts of traffic, but if I could monitor them, that could be useful. I jotted down every number I could see (which I also scrubbed from the above photo) and started Google. In a few minutes I found a technical installation guide, and from there I found an FCC ID. Using this FCC ID, I found more details about the device, most of which meant nothing to me. But the FCC page did include one critical bit of info: the wireless motion detector broadcast at 345Mhz. This isn't exactly a surprise, nor is it top secret. 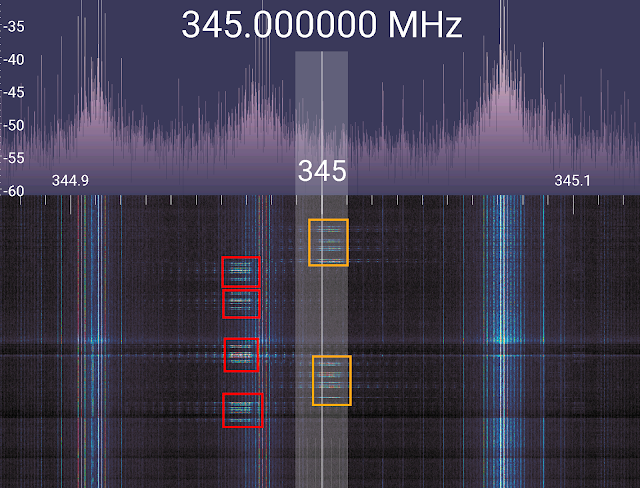 If you look at the 345Mhz spectrum, you'll see tons of devices that utilize it. From motion detectors to an Active Fall Detection Pendant. If I knew my radio devices better, I could have almost certainly skipped the above exercise and just assumed that my alarm peripherals operate at or near 345Mhz. The red boxes in the waterfall above correspond to me triggering the motion detector, while the orange boxes correspond to the front door. I was delighted to see that my assumption was correct. The alarm devices do sit there quietly and transmit when they are triggered. This is definitely information I can use. While this is interesting and all, it's not very useful. 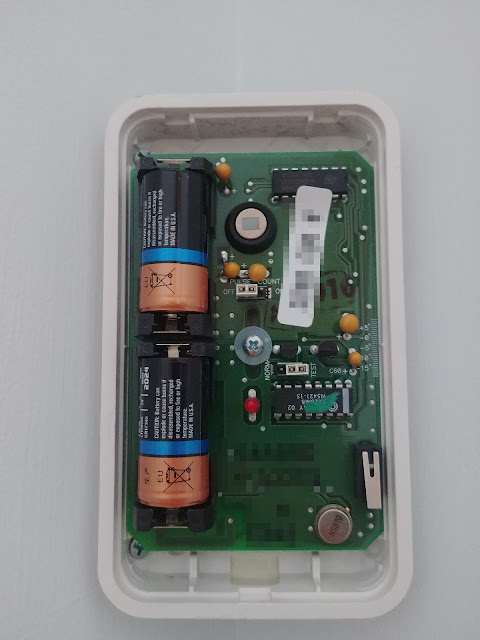 What I really need is a way of programmatically extracting this radio data and turning it into a stream of relevant data ("Door Triggered" or "Motion #2 Triggered"). That's the next challenge to tackle. Stay tuned.